Make chilly days extra cozy with your very own polar bear! This white plush measures 34-inches long x 20-inches tall! Features felt claws, padded paws, a soft black nose, and a lovable expression. 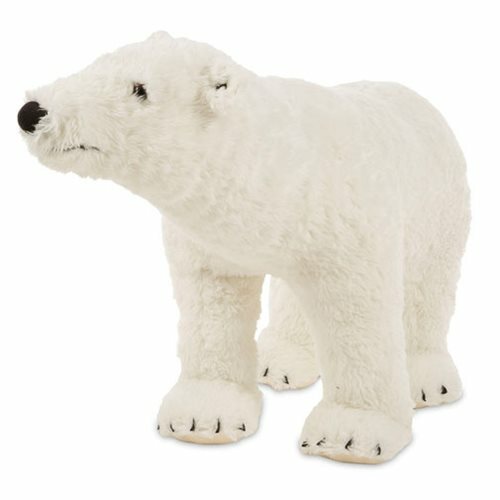 The beautiful white plush fur is both durable and incredibly soft to the touch, while the quality construction and a strong interior structure mean this Polar Bear Plush from Melissa & Doug will hold up to years of hugs and snuggling. Its impressive size (34-inches long x 20-inches tall x 11-inches wide) and an attention to realistic details like felt claws, huge padded paws, a soft black nose, and a lovable expression, make this a big bear that's sure to warm any heart! Ages 3 and up.